A very small, newly discovered asteroid will make a close flyby of Earth this Wednesday. 2010 AL30 was first seen by the LINEAR survey (same group that discovered the unusual comet P/2010 A2) on Jan 10 UT. The asteroid will pass ~80,000 miles or 128,000 km (0.00086 AU) from Earth at ~12:45 UT on Jan 13 (Wednesday morning). With an absolute magnitude of 27.0, the asteroid is probably on the order of 10 to 20 meters in diameter. Though it will safely miss the Earth, even if it were to hit it would be unlikely to do any damage as very little of it would survive passage through the atmosphere. A recent paper by Peter Brown (University of Western Ontario) determined the rate of impact for small asteroids based on global infrasound observations. An object 15 meters in diameter should hit the Earth once every ~50 years. Based on that statistic the detection of an object like 2010 AL30 should be rare. But the Earth is a small target. Extrapolating the Earth collisional volume to the volume of space within the distance of the Moon finds that ~600 objects of the size of 2010 AL30 pass within a lunar distance every year. These kinds of close approaches are not rare, and the great majority of them are missed by the current asteroid surveys which are optimized to find much larger (and actually dangerous) objects. 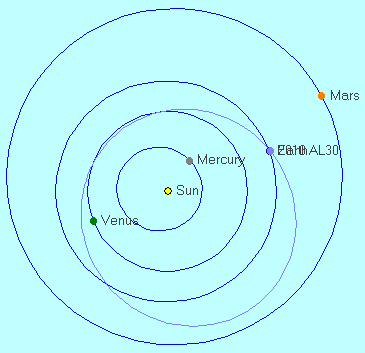 The orbit of 2010 AL30 is a typical near-Earth asteroid orbit (see the diagram below). It stretches from 0.70 to 1.30 AU from the Sun. With a semi-major axis of 1.001 AU, its orbital period is almost exactly the same as Earth’s. At its brightest the asteroid will reach magnitude ~14 which is far too faint to be seen by all but the most well equipped amateurs. Orbits and positions of 2010 AL30 and the inner planets for 2010 Jan 13. Created with C2A. How are you so convinced it is an asteroid? Remanzacco Observatory in Italy says it may be a man made object like a rocket booster. Our little take on it at http://www.ahrcanum.com is not so scientific but questioning. Wonder what we have in the sky to take a closer pix of it. Space Station perhaps? There are 2 reasons why I believe 2009 AL30 is a natural asteroid and not a man-made spacecraft. 1) The orbit is consistent with an asteroid but not with being a man-made spacecraft. The argument being made by a few people that it could be man-made is based on its very Earth-like semi-major axis of 1.001 AU. But its eccentricity is too high. The orbit ranges from the distance of Venus’ orbit to almost as far as Mars. A spacecraft launched from Earth would have an orbit that ranged from Earth to Mars or Earth to Venus, but not Venus to Mars or vice versa. Al Harris is correct that this orbit does not fit any orbit a spacecraft would use. We have detected a few (again very small) objects on very Earth-like orbits. One turned out to be a returning upper stage from Apollo 12. The others were all identified as natural asteroids. JPL plans to observe 2010 AL3 with radar and may even be able to resolve the disk of the asteroid. The radar reflection will tell us if the object is a rock or metallic. 2) There are so many more small asteroids out there than man-made spacecraft or space junk. There has sort of been a cottage industry lately of people declaring these objects on Earth-like orbits (AL30’s orbit actually isn’t very Earth-like, IMHO) as spacecraft. But the numbers suggest that there are thousands or more of these small asteroids on orbits similar to Earth. The supposed rarity of these objects says much more about our inefficiency at finding very small asteroids. Personally I like when we find a piece of returning space junk. I was part of a team that helped ID the returning Apollo 12 upper stage. But I doubt AL30 is nothing more than a small asteroid and I really wish I had time on one of the big scopes to observe it. Do some research, it is laughable to think that someone on the Space Station is going to be able to take a better picture than the Hubble. Here at Remanzacco Observatory we have never say that 2010 AL30 is a man-made object. We have been among the first to image and follow-up this object. Soon after we wrote a post about it on our blog in which we mentioned that there was some early speculation that the object was a man-made object rather than a natural one. After that, we reported the Alan Harris consideration about the nature of 2010 AL30 and thought this closed the issue. Unfortunately, mysteriously, some non-astronomical news related websites have uncorrectly reported that we told something about the man-made nature of 2010 AL30. But we never talk with these people or wrote something like that. Looks like the news was more fascinating with the inclusion of a “mistery” about the nature of the object.